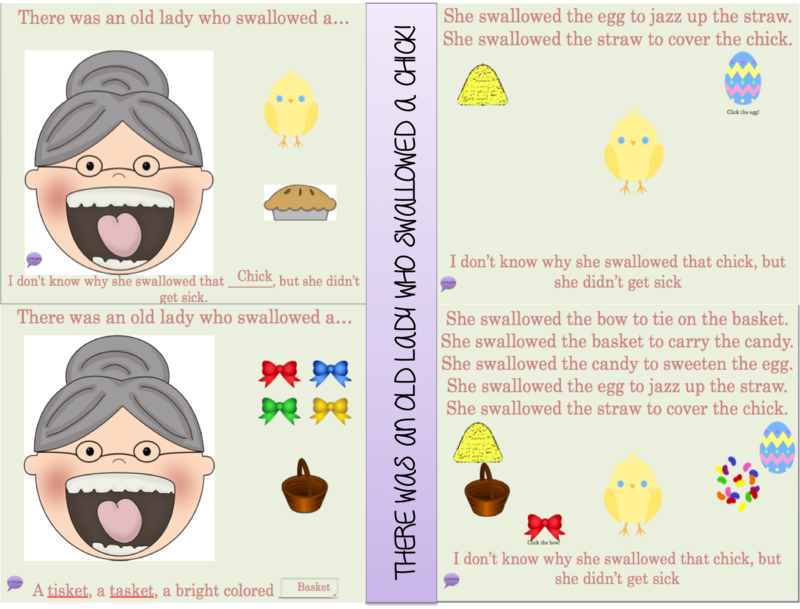 There Was An Old Lady Who Swallowed A Chick! Interactive Activity! Lately I've been trying to get a bit more tech-y with my activities. After receiving some feedback about the use of my "There was an old lady who swallowed a clover" activity, I decided to branch into the easter version! Here's why I love interactive activities...they're awesome for non-verbal students who want to participate, they cut-down on your paper cutting/laminating/pasting time, they never look used or dull after a few years, they can be used on an ipad, smartboard, or touchscreen computer! The rules are the same with this activity, click on the correct item that the old lady swallows and watch it fly into her mouth! Use this for sequencing, rhyming, inferencing (what's next..), etc. It's a great addition to the story!